May 14, 2018 – Planting Season Begins! / ¡Inician las siembras del 2018! [Español abajo] Planting season has begun: yesterday we distributed 2,000 saplings to more than a dozen landowners throughout the watershed, with help from University of Costa Rica volunteers. 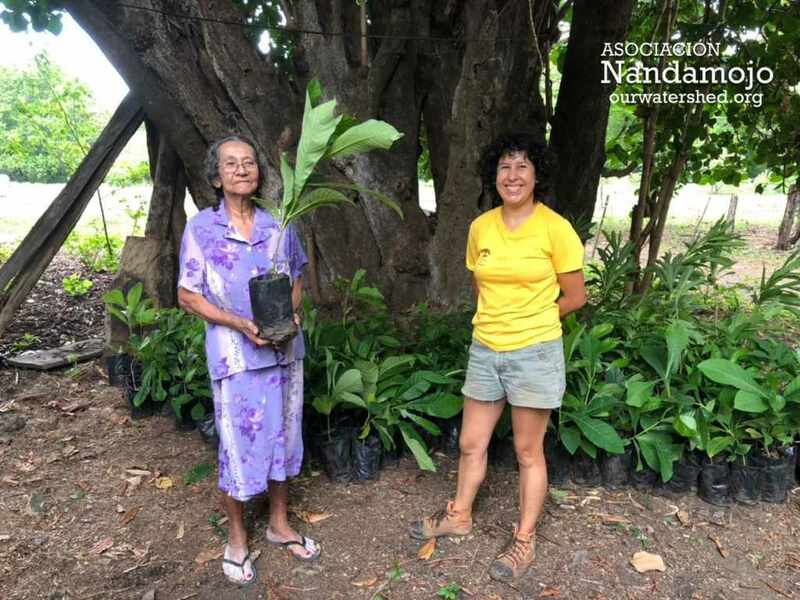 Our reforestation efforts have taken a major leap forward this year thanks to Marcia, her husband Alberto and the watershed high school students who tirelessly worked to stock our reforestation nursery. The saplings are extremely healthy and have spent just months in their bags, so they are ready for new homes and growing space. Marcia Gómez Cortés (derecha) entriega árboles jóvenes a una propietaria de la cuenca Nandamojo. Mucha gente ha pedido árboles provenientes de nuestro vivero forestal. The Nandamojo watershed’s fire brigade spent yesterday morning (February 8) putting out two small fires at the La Gongolona farm, located in the south-eastern section of the watershed, near the “El Maderal” hill. They were able to ensure that the fires did not become uncontrolled forest fires. The brigade was established this year (2018) and its members have received a 40-hour training course coordinated by SINAC. They now have a nationally-backed insurance policy and tools provided by the government. There will be another training course starting this Sunday at 8 a.m. at the community center in Las Delicias; if you or someone in your organization or company is interested in receiving this training, please contact Matt Rosensteele or Marcia Gomez. 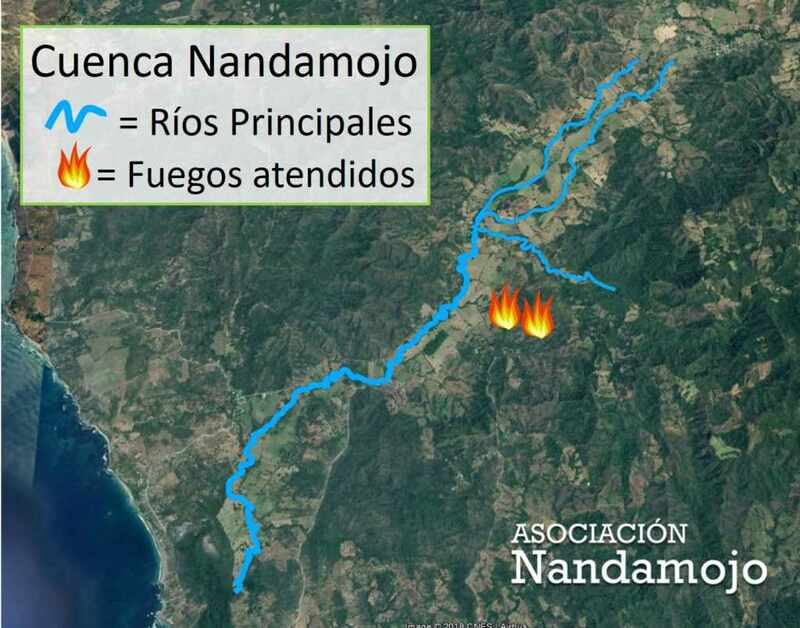 La brigada en acción: ayer miembros de la brigada de bomberos forestales de la cuenca Nandamojo apagaron dos fuegos en la finca La Gongolona, ubicada en los cerros surestes de la cuenca, cerca del cerro “El Maderal.” Lograron evitar que los dos fuegos convertieran en incendios forestales descontrolados. La brigada fue fundada este año y completaron un curso de 40 horas capacitación completo del SINAC. Ahora tienen póliza del INS y herramientas. Se hará otro curso de capacitación, el cual inicia ESTE DOMINGO a las 8 a.m. en el salón comunal de Las Delicias. Our 2017 CosechAgua Symposium was overflowing with participants. We had 50+ stakeholders come to our opening presentation and dinner at Restaurante Latino. Following that event, we spent every Sunday of the month of August implementing restoration projects with landowners throughout the Nandamojo. August was an extremely productive month for us. We've spent these last weeks planting trees and erosion control plants throughout the watershed, through our "CosechAgua" series of workshops. We started the month planting trees along the headwaters of the Rio Limones, one of Nandamojo's most important tributaries. You can bet your boots that Ticos don’t have a habit of reading Winston Churchill. The handling of and the proposals to address the recent drought and ongoing water crisis in Guanacaste is the case I propose to put under the microscope and offer a bit of contrarian perspective. Let’s take a look at some of the facts. Residents of Tamarindo, Avellanes, Los Pargos and any number of other coastal communities by now have probably lost track of the number of water trucks they’ve seen lumbering down the roads over the past few years. My friends Marcela and Garrett Hurley, proprietors of Amigos Bar and Grill, have been hauling water on their motorcycle as part of their daily routine for more than a year. Other amigos realized that something was a bit weird with their wells when the more they watered, the more their plants wilted, withered and went the way of the crops in Carthage after the Romans plowed salt into the soil. Official reports state that underground water supplies of Tamarindo and two communities further north are already experiencing ‘salt water intrusion’. The ocean is moving in because too much fresh water is being sucked out by coastal developments and, due to the drought, not enough is flowing in underground from the landward side, from the watersheds that feed the aquifers. The official prescription is that the aquifers need a bit of R & R–no more wells, no more connections—and then, si Dios quiere, we’ll be back to business as usual. Unfortunately, “usual” seems to have split town and headed for greener pastures. I can’t say as I blame the guy. Without going into the confusing plethora of overlapping agencies dealing with water in Costa Rica, or delving into the as-yet unsuccessful efforts to reform the “Ley de Aguas”, the overarching regulatory framework that dates back to 1942, all I can say is that the powers that be completely failed to take advantage of the ‘crisis/opportunity’ that this drought served up on a silver platter. The bottom line: we don’t have a plumbing problem, we have a land use problem within the context of a changing climate, a conjuncture that calls for the kind of creativity, invention and large strategies that Einstein referred to above. Next time we’ll look at some successful efforts, both globally and locally, that hold out some hope to prevent Samara from turning into the Sahara, and Tamarindo from resembling Timbuktu. Watch our 2016 riparian corridor project video here. The Nandamojo watershed was developed for cattle ranching during the early part of the 20th century. Huge swaths of forest were clearcut to create pastures, and the clearing was done without regard for the protection of water resources. One of the most extensively-cleared areas was the floodplain at the heart of the watershed, between the community of Rio Seco, where the Nandamojo’s major tributaries come together, and the mangrove forest surrounding the river’s estuary at the Pacific ocean. In many parts of that section, which measures about 12 kilometers, farmers and cattle ranchers cleared forests right up to the edge of the waterway. Forests along riverbanks, called “riparian forests,” provide habitat for countless flora and fauna while shading waterways, slowing evaporation. The forests also play a critical role in removing contamination from runoff during rain, and stabilize riverbanks to prevent erosion. The damage done by eliminating riparian forests is visible throughout our watershed. Destabilized stream banks have collapsed or are collapsing, many species of animals and plants have disappeared, and a river that once flowed year-round is now dry for most of the year. In 2015, we set out to create a plan to re-establish and protect forests on both sides of the Nandamojo along those 12 kilometers of river that were most affected by deforestation. We began with a thorough analysis of that section, mapping out land ownership, analyzing existing vegetation and assembling an aerial photo-map of the entire stretch. 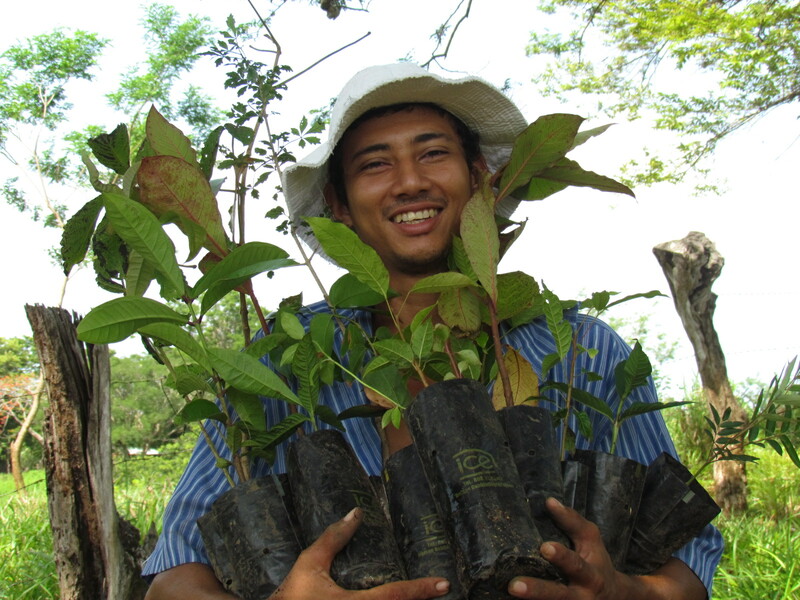 Through that process, we prioritized areas where reforestation will have the greatest impact and developed relationships with the landowners involved. Next, we developed a strategy to motivate landowners to participate. We decided to use a system of payments for ecological services, funded by profits from the sales of Bees for Trees honey. Through that system, landowners with farms along the river are paid to reforest and protect riparian areas within 50 feet of the river bank. We offer about $800 per acre protected, which is comparable to payments offered through similar programs managed by the Costa Rican national government. In order to receive payment, participants sign contracts that define the scope of the restoration work and grant access their farm for follow-up inspections. In addition to financial incentives, our organization provides participating property owners with materials needed to fence off the area, saplings to plant and technical guidance for support in the restoration process. This year, we’ve signed contracts with five landowners covering five acres of riparian zones that were identified as some of the most deforested sections of the river. Those landowners have installed cattle-proof fences and are in the process of planting 1,000 saplings in the newly-protect areas. Costa Rica’s national groundwater ministry (SENARA – Servicio Nacional de Aguas Subterráneas, Riego y Avenamiento) has provided us with an important report on the Nandamojo watershed and its aquifers. The hydro-geologic study, authored by Roberto Ramirez Chavarria, is an analysis of three important aquifers in the Guanacaste region and was published in 2010. The document has long been the subject of local gossip and speculation, as most watershed stakeholders had never seen its contents. The report indicates that the Nandamojo watershed’s aquifers have the potential for a far greater annual recharge (some 30 million cubic meters of groundwater) than the amount needed by humans (estimated to be some 2 million cubic meters). For several reasons, however, the findings need to be reviewed and further analyzed before it can be concluded that the Nandamojo’s aquifers will always have plentiful water. 1) The “water balance equation” used to calculate recharge potential assumed 1.7 meters of rain annually, far more than the watershed has received in recent years. The single most important variable in the calculations used is the amount of water entering the Nandamojo basin, and the 1.7 meters of rain used was based on the average annual rainfall measured at a meteorological station about 15 kilometers outside our basin from 1995 to 2007. Both in the long and short term, the Guanacaste region has been receiving decreasing amounts of rainfall. The drying has been exacerbated by climate change, which is causing stronger “El Niño” phenomena in the Pacific Ocean. Those phenomena have been directly linked to drying in our region, which has measured significant annual rainfall deficits. Last year, our rain gauge measured 1.1 meters of rainfall, about 35% less than the assumed amount. That would have dramatically reduced the watershed’s potential recharge. 2) Extraction statistics are based on estimates. It is difficult to get a complete understanding of the amount of water used in any area in Costa Rica, and the Nandamojo is no exception. The estimates used to calculate extraction statistics, or the amount of water used by people in the watershed, are based on legally-registered wells, which probably represent only 50-60% of the actual wells in the basin. 3) All calculations are based on old data and do not project for climate change or growth in consumption. The “water balance equation” is extremely complex, but its purpose is to define how much water goes in and out of a watershed every year and determine how much water is “produced” there, or how much can be extracted annually on a sustainable basis. Important variables in this equation will definitely change, including annual rainfall (as discussed above), average annual temperature and the amount of water extracted by human communities. The report was published in 2010 and the authors essentially produced a snapshot estimate of the water balance in the Nandamojo for that year. However, Guanacaste is becoming drier, hotter and more populated. All three of those factors will have negative impacts on the water balance equation in the Nandamojo. Moving forward: First, ROW is analyzing this report and we have found technical support to help us better understand its contents. After completing a more thorough analysis, we’ll be hosting forums to discuss it and the Nandamojo’s water balance equation with stakeholders. Second, we have established a groundwater monitoring network to monitor the ongoing health of our aquifers and update the report’s findings. There are serious threats to the Nandamojo’s water resources, and other aquifers in our region that had previously been declared stable have now become stressed through mismanagement. We continue work to address those threats and ensure that the Nandamojo’s aquifers provide abundant water for prosperous animal, plant and human communities.